Shaman’s drum, Sami drum, frame drum… Our drums have many names and purposes. Back in the day, Shamans (local healers) used them in treatments and prophecies all around the world. Nowadays these drums are used to meditation, healing, relaxation and just for the fun of playing them. The sound of the drum has a relaxing effect that helps you clear your thoughts after a busy day. Playing the drum might help when you’re depressed or angry as the sound and the act of playing when you need to vent your feelings. Adding some movement while playing, might help you feel less stressed. The deep sound dives deep into the cells in your body and gives you healing sound therapy which – when combined with meditative drumming – does good for your body and mind. 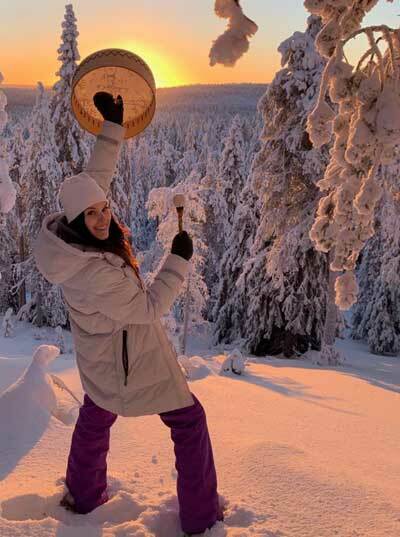 Our drums are original Finnish handicraft. The frame is made of birch plywood and the hide is of Finnish reindeer – undyed or dyed with water based stain. Some of the drums are hand-painted by an artist. For the drumstick a dried branch has been gathered from a Finnish forest and fitted with a wool or fabric tip. A drum is practical, healing, and beautiful item for playing and to display. In case you can’t find a drum you are looking for, we can design and build one according to your needs! Unique drum is also a great gift and can be decorated with an image of your choosing. Email us at info@shamaanirumpu.net for more information.